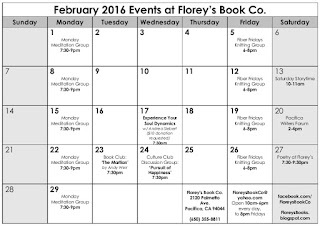 February 2016 Events at Florey's Book Co. Learn simple ways to take charge of your interactions with life and people. Energy work with the Bully-Victim Dynamic will be featured. Management of it can anchor justice in your world. Requested $10 donation in appreciation of the presentation and the space. Feb. 20th, 2-4pm. Come and share the joy of writing, reading, and poetry! Get to know your neighbors, read and discuss the book of the month. Engage in conversation on a monthly topic. 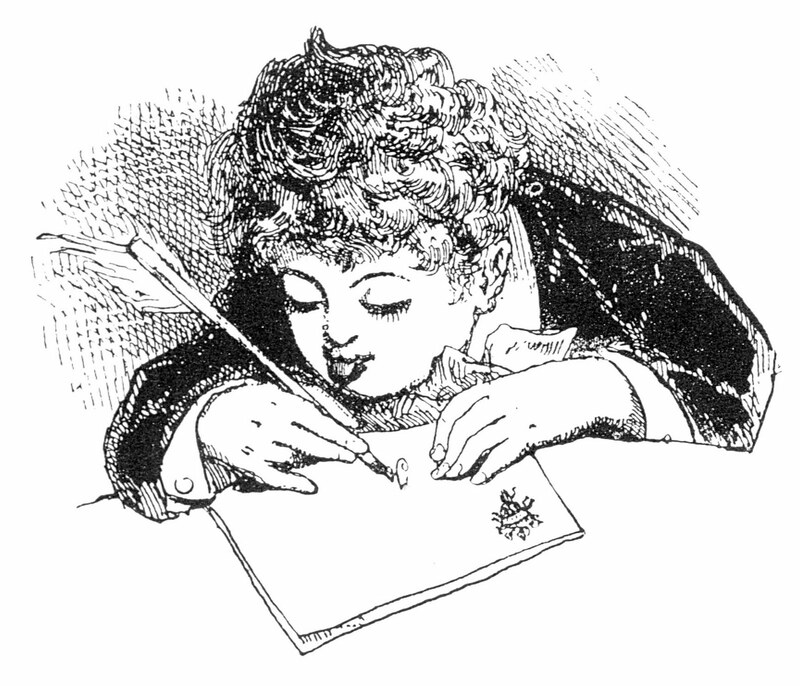 January 2016 Poetry at Florey's! The featured poets this month are: John Landry and Robbie Sugg. The featured poets will be followed by an open mic period. Open mic sign-up is first come, first served. This event is open to the public and free of charge. You are welcome to bring a snack or beverage to share. John Landry has survived as a shellfisher, factory worker, warehouseman, homeless advocate, civil-disobedient, librarian, and teacher. His book quién va a podar los ciruelos cuando me vaya/who will prune the plum tree when i'm gone (2010) was published by Editorial Cuneta in Santiago, Chile. In the shadow and light of Melville and Douglass, he served his hometown of New Bedford, Massachusetts as poet laureate He was a contributing editor for the 50th anniversary anthology of San Francisco's historic Beatitude.. His work has appeared in Amerarcana, Istanbul Literary Review, Caesura, Cape Cod Poetry Review, El Tecolote, , Generación, Azolotl. North Coast Poetry Review. He read his work at the Library of Congress, at the invitation of Gwendolyn Brooks. His next books are to be titled anthropocene debris and Not Less Than One. Robbie Sugg was born in Berkeley, California in 1987. After spending his childhood in a commune in the hills above Lafayette, California, he was later raised in Concord, and came of age in San Francisco. His interest in Japanese culture led him to Kyoto, Japan where he lived for the Autumn of 2006. He holds a Bachelor of Arts degree in Painting, Drawing and Printmaking with a minor in Japanese, from San José State University. His artwork has been exhibited throughout the San Francisco Bay Area, as well as in New York City, Massachusetts, and England. His poetry has appeared in journals in the United States and in India, including Elohi Gadugi, Caesura, The Café Review, Cape Cod Poetry Review, The Newport Review, Flying Fish, Earthen Lamp, and others. His first book, Koccha and Other Poems, was published in the Spring of 2014 by DaysEye Press. He is currently based in downtown San José, California. 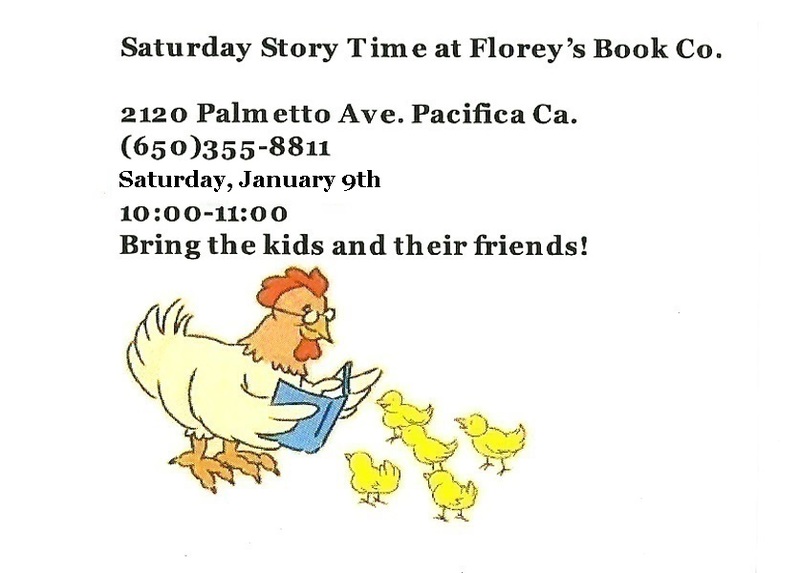 Pacifica Culture Club: 'Food Pt.2: Eating the World Alive', Jan. 27th at Florey's! Florey's welcomes you to our culture discussion club! So this next topic is a two-parter! It's FOOD. Yay! We get to talk about food. But there's a ton of topics within this so we'll be splitting it into two meetings. This will be the second of the two meetings on this topic. How the food we eat affects the environment & world at large. 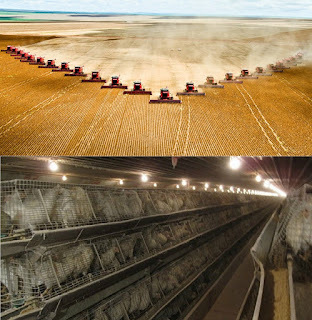 Food waste, farming practices, pollution, etc. will be next month! Bring the stories that inspire, encourage and fascinate you. Welcome newcomers, welcome as always regulars. Be proud to be part of the conversation. 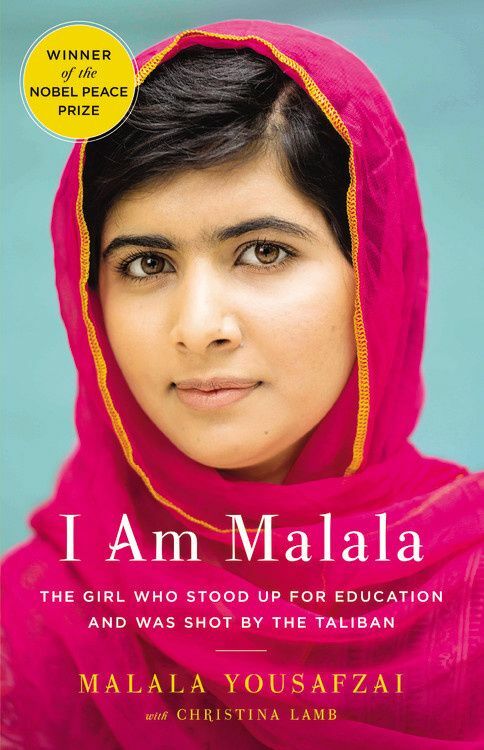 Pacifica Book Club: 'I Am Malala', January 26th at Florey's! Florey's welcomes you to our book club! Come by for a chat about our January book, 'I Am Malala'. It's an autobiography by the youngest Nobel Peace Prize winner, Malala Yousafzai, a young girl who stood up to the Taliban and survived an assassination attempt to champion girls education in Pakistan. Read about this incredible young woman and join our friendly and open group to talk about what you thought of the book and it's topics. All are welcome, snacks and drinks to share! 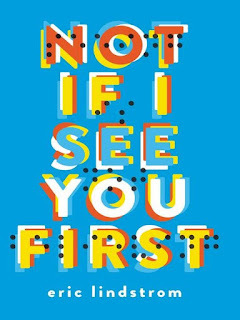 "Not If I See You First" Book Event with Author Eric Lindstrom, January 23rd at Florey's! 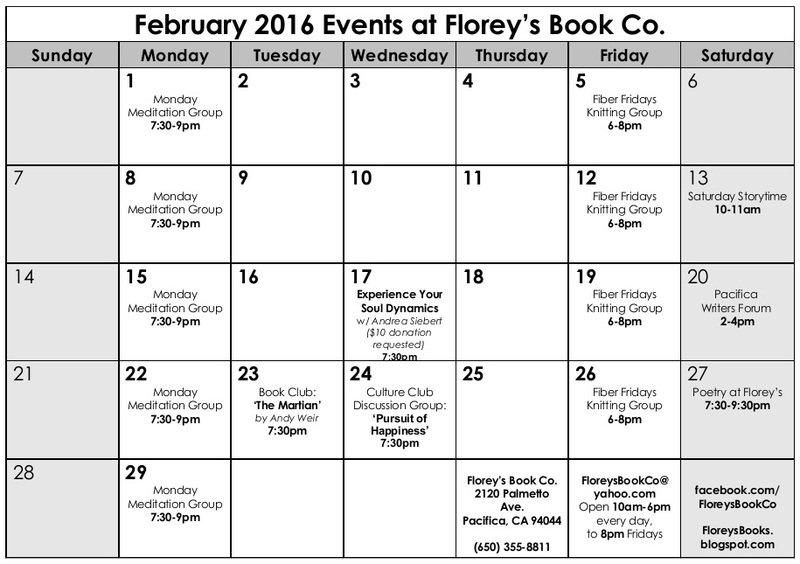 Florey's Books welcomes Pacifica author Eric Lindstrom as he discusses his new book, "Not If I See You First". Don't deceive me. Ever. Especially using my blindness. Especially in public. Don't help me unless I ask. Otherwise you're just getting in my way or bothering me. Don't be weird. Seriously, other than having my eyes closed all the time, I'm just like you only smarter. Parker Grant doesn't need 20/20 vision to see right through you. That's why she created the Rules: Don't treat her any differently just because she's blind, and never take advantage. There will be no second chances. Just ask Scott Kilpatrick, the boy who broke her heart. When Scott suddenly reappears in her life after being gone for years, Parker knows there's only one way to react-shun him so hard it hurts. She has enough on her mind already, like trying out for the track team (that's right, her eyes don't work but her legs still do), doling out tough-love advice to her painfully naive classmates, and giving herself gold stars for every day she hasn't cried since her dad's death three months ago. But avoiding her past quickly proves impossible, and the more Parker learns about what really happened--both with Scott, and her dad--the more she starts to question if things are always as they seem. Maybe, just maybe, some Rules are meant to be broken. Eric Lindstrom is a BAFTA and WGA-nominated veteran of the interactive entertainment industry. 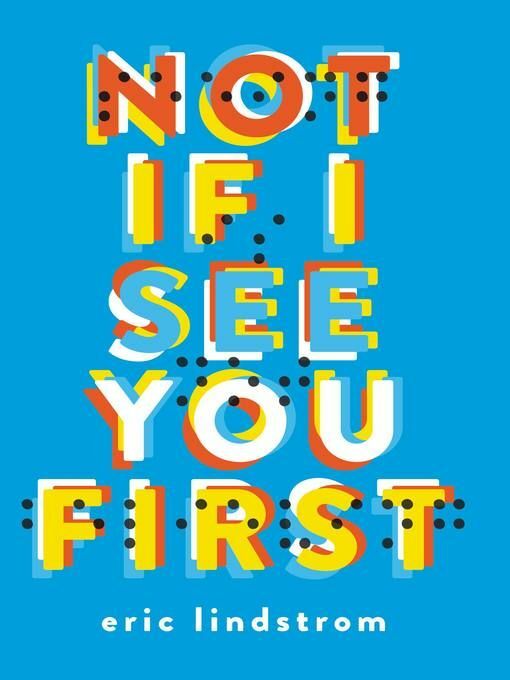 'Not If I See You First' is his debut novel. He has also raised children, which led to becoming first a school volunteer, then a substitute teacher, then a part time kindergarten teacher, then getting a credential to teach elementary school, and most importantly the discovery that Young Adult books are awesome. It’s pretty much all he ever reads, and now writes, in his house near the beach on the west coast, with his wife and, yes, cats. Eric invites you to find him online at ericlindstrombooks.com and on Twitter @Eric_Lindstrom. 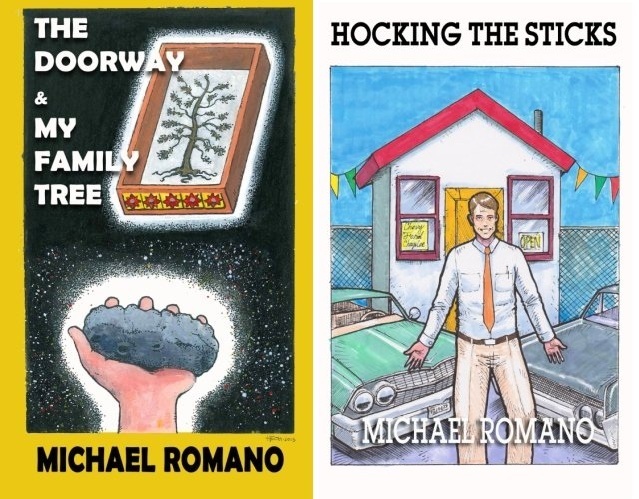 Two-Book Event with Author Michael Romano, January 16th at Florey's! Florey's Books welcomes local author Michael Romano as he discusses his new books, "The Doorway and My Family Tree" & "Hocking the Sticks". First, a young-adult novel, "The Doorway and My Family Tree". Two amazing tales that cross time and space, and prove that anything ... and anywhere ... are possible! Next, a memoir, "Hocking the Sticks". The unbelievably true story of one man's life in the "Iron Sale Business." Scam artists, collection agents, drug dealers and business practices so slippery, you had to hold on both hands! In other words ... the time of his life! 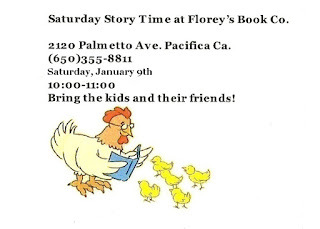 Saturday Story Time at Florey's!